B.C. businesses were shell-shocked by a $4.2-billion tax wallop inflicted by Finance Minister Carole James in Tuesday’s budget. That’s how much money the B.C. government will extract over three years from businesses under a new “Employer Health Tax” to replace phased-out Medical Service Plan premiums. “This is a hammer that came down that we didn’t see coming,” complained Iain Black, president of the Greater Vancouver Board of Trade. The new payroll tax will only apply to businesses that have a $500,000 total payroll and higher, something James said will protect small business. But Black scoffed at that. He also pointed out many large corporations already pay their employees’ MSP premiums as a workplace benefit. Since MSP is being phased out, the new payroll tax will just replace it with little net impact. In fairness to James, she did say during the election that an NDP government would phase out MSP and find new revenue sources to pay for health care. “We’re going to be looking at everything,” she said, though you can’t blame blindsided employers for feeling like she didn’t look very far. Here’s the risk for the new government: In their quest to make life more affordable for working people, they could trigger unintended consequences. “When you hit the small-business community with an additional payroll tax, there’s only two things they can do: Hire fewer people or don’t give raises to the existing ones they have,” Black said. That didn’t seem to worry James, as she laid out a three-year budget plan predicting steady economic growth through 2021. But while the budget hyped lots of new spending on social programs (especially child care and housing) and lots of new taxes to pay for it, there was a glaring lack of attention on the province’s foundational industries. James delivered a budget presentation at the Victoria Conference Centre, and then a budget speech in the legislature, that completely ignored forestry, mining, oil-and-gas development, fishing, aquaculture and energy generation. There was not even a single mention of any of these lifeblood B.C. industries. Not one. That’s pretty shocking. By focusing solely on social spending and raising taxes, the NDP runs the risk of further alienating the rural north, interior and coast of B.C., where unfairly snubbed resource industries make the lavish spending possible. West Kelowna – By pushing BC wine producers into the cross-fire of his self-inflicted trade war with Alberta, John Horgan is putting at risk thousands of jobs and small businesses – prompting many to wonder which industry will be next. 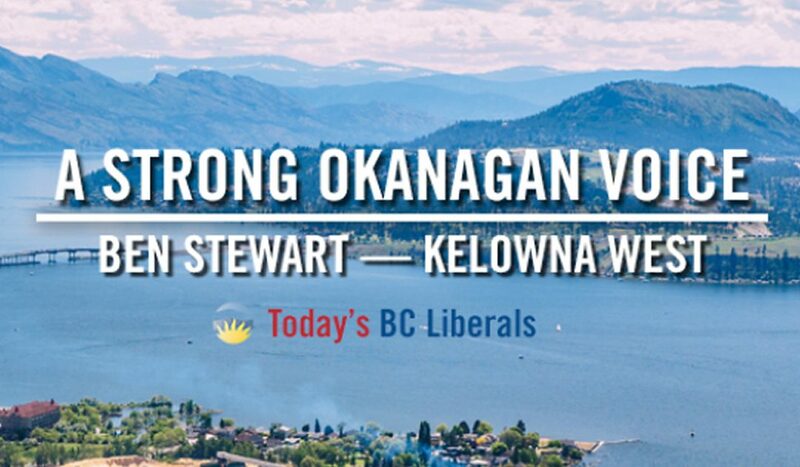 Stewart was responding to Premier Horgan and Agricultural Minister Lana Popham saying they will defend B.C. business after Alberta announced it will stop purchasing B.C. wine due to the BC NDP’s attempts to further delay the Trans Mountain Pipeline. The B.C. wine industry’s $2.8 billion economic impact is a significant driver of the province’s economy and more than 12,000 people in every region, of the province have jobs as a result of this industry. Below are the full riding-by-riding results for Leadership 2018.